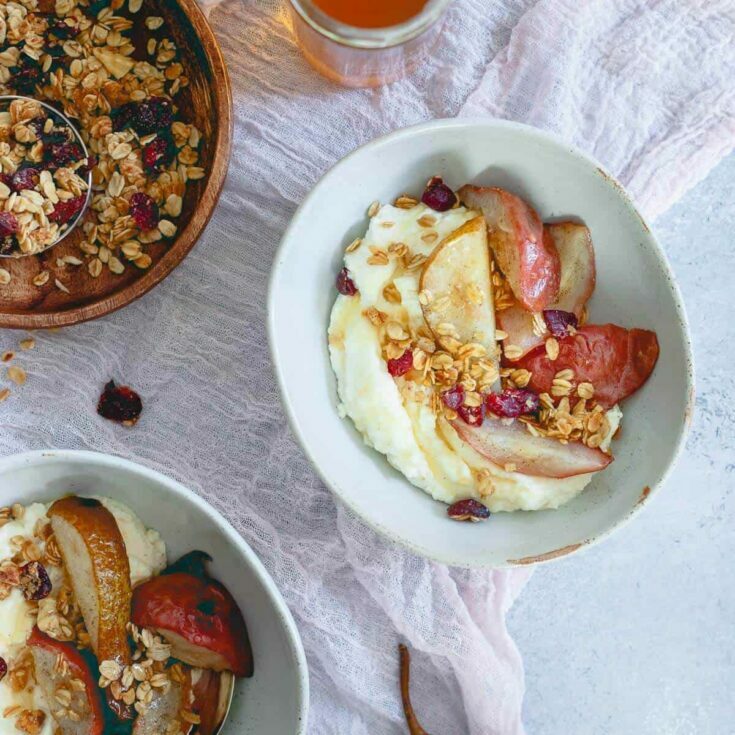 These whipped ricotta bowls are infused with orange and cardamom flavor then topped with roasted pears and cranberry granola for a fall treat! I’ve done a bunch of fun things with granola before from coating French toast with it, baking it into pear bread, making chocolate bark with it, putting it in rose hip ice cream to even using it as a topping for cauliflower pumpkin mash. So, I kind of struggled when trying to think up a way to showcase Udi’s gluten free cranberry granola because it almost seemed like it had all been done already. When I really sit down and think about it though, my favorite way to eat granola isn’t in or on other things, it’s either straight out of a bowl with some milk (like homemade vanilla coconut oat milk) or sprinkled on top of yogurt bowls and the like. Basically, how granola was intended to be eaten. So, while it’s fun to be creative sometimes and do other things with it, I’m not lying when I say this quintessential simple fall recipe of roasted pears atop orange and cardamom whipped ricotta bowls might just be my favorite. I went through a fresh ricotta phase a couple years back (evidenced in these pictures of grilled zucchini stacks) but then sort of forgot about it. When the idea for whipped ricotta bowls came to mind though, I knew no store bought ricotta would do, it had to be fresh whole milk ricotta – the kind in a metal tin overflowing the top. Yeah, that stuff blows everything else out of the water and makes these creamy whipped bowls of deliciousness even creamier. 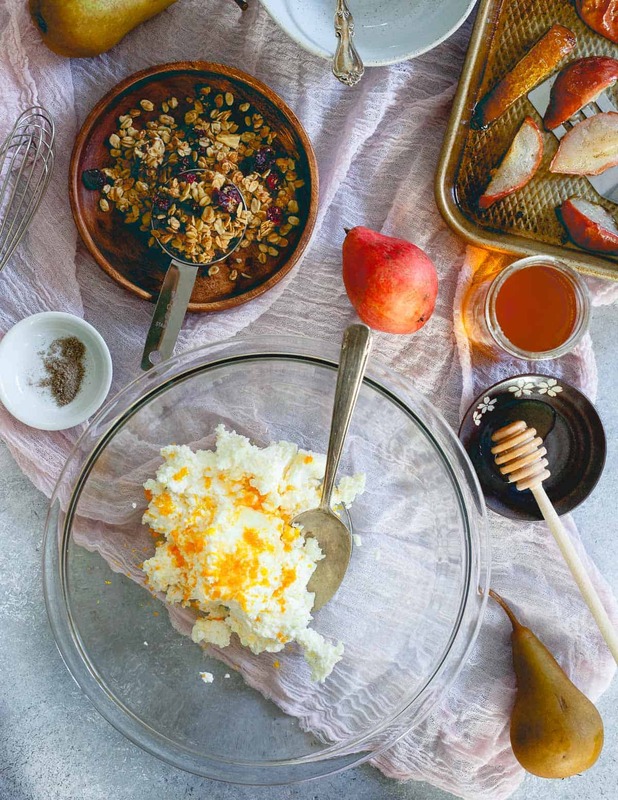 Infused with some orange zest, orange juice, cardamom and honey, the ricotta alone with some granola sprinkled on top would be aces but topped with a spoonful of olive oil and cardamom roasted pears, it’s a fall snack bowl that can double down as dessert if needed. The creamy, slightly sweet ricotta with the hearty pears and crunchy Udi’s granola is as much texturally satisfying as it is tasty. When it comes to granola, there’s a time and a place for each kind. The really “cluster-y” ones I find great when you want it to act like cereal in a bowl of milk. The more loose oat types are perfect for using sprinkled on top of something like these whipped ricotta bowls. That’s why I love Udi’s cranberry granola in this one, you get a bit of granola in each spoonful and just enough sweetness from the dried cranberries every now and then. It makes you appreciate granola for what it is, a hella delicious carb and a great addition to these orange cardamom ricotta bowls. Love this whipped ricotta bowls recipe? Toss pears with olive oil, cardamom and salt and spread out onto a baking sheet. Roast for 10-12 minutes, flipping once. Remove from oven and let cool a few minutes. 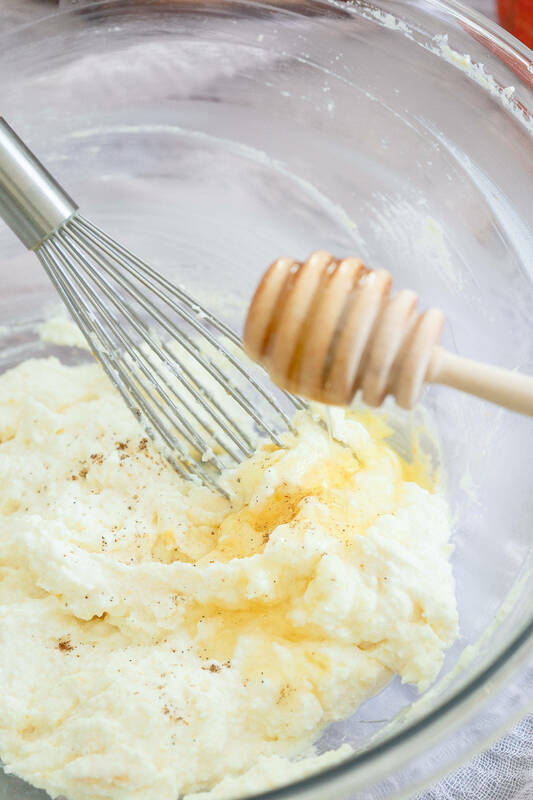 Whisk the ricotta, orange zest, orange juice and honey together in a medium bowl until smooth and creamy. 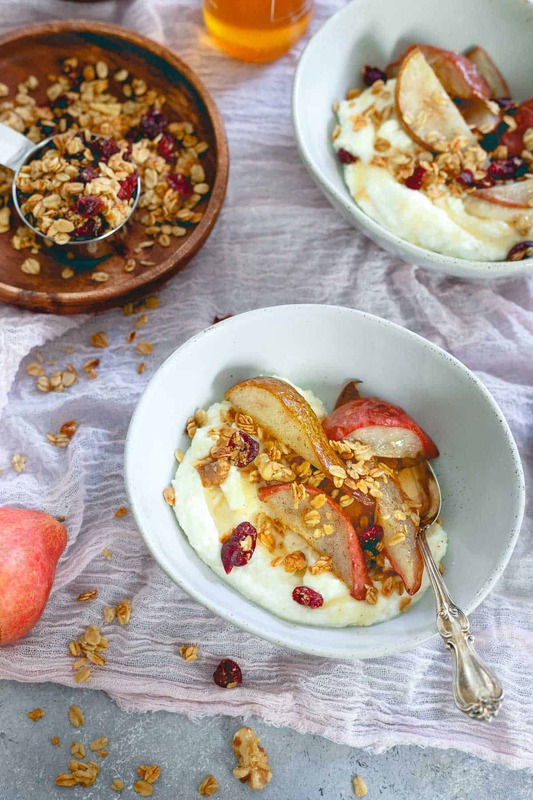 Spoon the ricotta into 2 bowls, top with the roasted pears and sprinkle the granola on top. Drizzle with additional honey to serve. Wow these sound FANTASTIC! Love the flavor combo! Love this. I’ve never thought of pairing ricotta with granola.